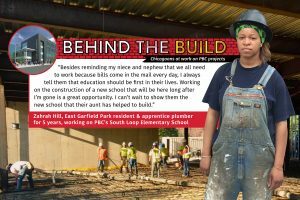 Zahrah Hill, resident of East Garfield Park and apprentice plumber, gained trade experience working on PBC’s South Loop Elementary School project. Subcontractors and subconsultants, selected by General Contractors and Architects of Record, play a large role in building the new public facilities developed by the Public Building Commission. The PBC recommends that interested consultants and contractors sign up for PBC Alerts to stay informed about upcoming projects. The PBC Alert system allows firms to learn of future PBC projects and the architecture or construction firms involved. The PBC is committed to client service and strong stewardship of public resources. We make every attempt to ensure transparency in our contracting process. Contractors are critical in ensuring that the project is delivered to our client agency in a timely and cost effective manner. Contractors and their subcontractors are encouraged to work collaboratively to establish expectations with regard to on-site performance and critical time sensitive milestones related to projects. To further assist vendors in recognizing their rights and responsibilities on important project-related matters, this packet is sent to all subcontractors, suppliers and consultants on each new project. For additional information, please download our compliance brochure.